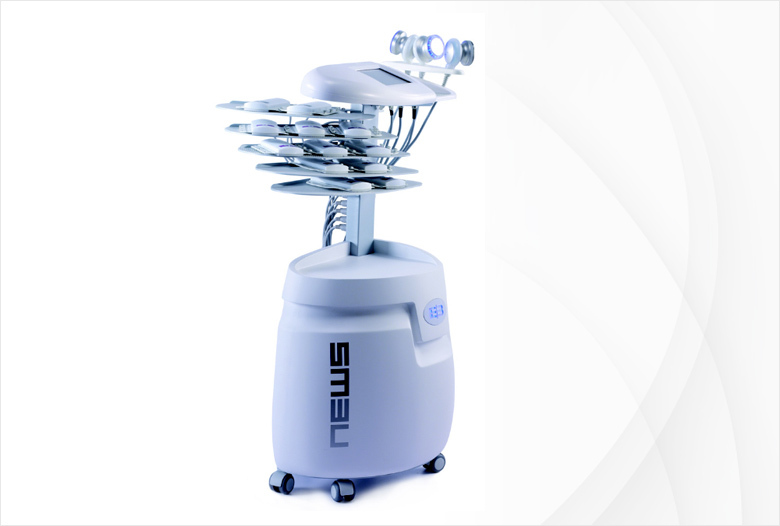 The NEWS is the only equipment that enable to simultaneously and selectively treat internal, external and localized fat. The NEWS is easy to use thanks to many details that enable an ergonomic application. Its painless “hand free” treatment lasts only 20 minutes. Associating strong efficiency with high profitability, the NEWS is the ultimate device to have for a successful and comfortable slimming program. - for superficial fat. Reduce the ungraceful appearance of orange-peel skin. - for the internal and subcutaneous fat layers. - for localized fat in order to lift and smooth the skin. Each ultrasound plate contains an assembly of 3 supra-conductor ceramics. Therefore, with up to 40 points of impact on superficial fat and the sympathetic nervous system, the NEWS can treat the whole body. The NEWS can treat a very large area in only one session, and activates the lipolysis process in less than 30minutes. A complete slimming action associated to reshaping affects produce improved and visible results. • 10 hand free plates with 3 supra-conductor ceramics, so you can deliver 30 points of impact to the subcutaneous system for superficial fat. • 2 hand free plates with 3 supra-conductor ceramics, so you can deliver stimulative signal to the sympathetic nervous system for deep internal fat. • 2 ultrasonic hand probes with Luminology, so you can have precise and localized action. • 5 removable shelves to apply the gel and organize your session, so you save place and time. ⇒ When applied to adipose tissue, this energy is capable of breaking the cell membrane and molecular chains of fat cells leading to lipolysis and their partial destruction. 1. Implosive cavitation in order to reduce the adipose tissue by selective destruction. 2. Stable cavitation using plates that cover larger areas and activate the metabolic lipolysis process in less than 30 minutes on superficial fat. 3. Stimulation of the sympathetic nervous system to trigger the lipolysis of deep internal fat. 4. Anti-inflammatory action of high-frequency ultrasound contributing to post-cavitational reconstruction.